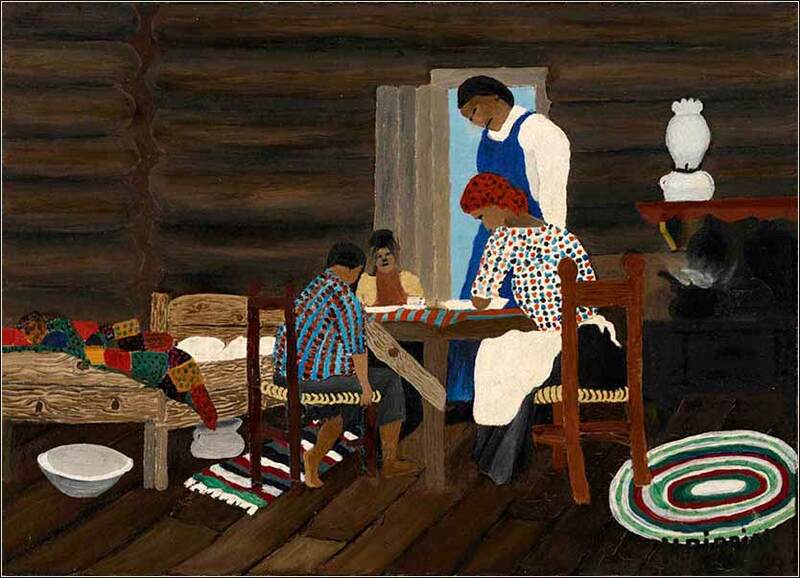 Giving Thanks, Horace Pippin ca. 1940. Heavenly Father, I pray especially today for those who have great wealth, for those who hold great power; for the rich, the famous, the beautiful, the talented, the intelligent: for all who have been given an unusual abundance of earthly gifts and enjoy the accolades of their fellow man. Guide them in the use of their gifts, O Lord, but especially, have mercy on them, for with great blessings come great temptation to pride. Lord, as I offer you all that is ordinary and everyday in my life, I ask you to give me the power of your Spirit that I may transform each day by living with a positive attitude, looking for the best in people and situations. Inspire me to live in your presence every day so that I may have a full share of the hope only your Spirit can bring; lead me do the ordinary things of life in an extraordinary way, to your glory. 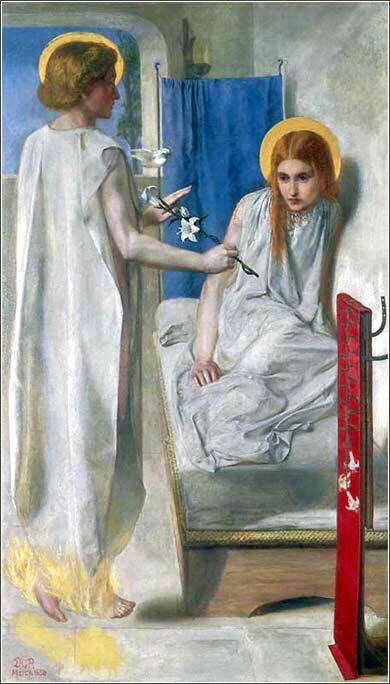 The Annunciation by Gabriel Dante Rossetti, ca. 1850. Another great Annunciation from the pre-Raphaelite school. A thorough description of the painting is given on the Tate Museum's website. There are four ways God answers prayer: 1) No, not yet; 2) No, I love you too much; 3) Yes, I thought you’d never ask; 4) Yes, and here’s more. God answers all our prayers. Sometimes the answer is yes. Sometimes the answer is no. Sometimes the answer is, you’ve got to be kidding! This passage has enormous importance in instructing us about our relationship with God. Heretofore in Exodus, we have seen two types of relationship: First, God as the giver of absolute laws, who speaks and expects obedience. But earlier, in the burning bush verses, Moses protested against the role God wanted to give him and argued that he was not suited to it; but God patiently persevered and eventually convinced Moses. Here, we see a third type of relationship: For not only does Moses argue with God, but also, his argument prevails. He intervenes for the Hebrews against God's expressed intention of destroying them and starting over — the verse “I will make a great nation out of you” means that God proposes to destroy all of the Hebrews except Moses and make Moses a new single patriarch, like Abraham, whose children will become God's chosen. Moses makes three arguments. 1) God should not nullify His great work in bringing the Hebrews out of Egypt; 2) Even worse, the Egyptians would consider themselves victorious over Yahweh and say that His intention was to destroy the Hebrews all along; and 3) It would not be consistent with God's promises to Abraham, Isaac and Jacob. This intimate relationship with God reminds us very much of Abraham, especially where Abraham pleads with God not to destroy Sodom in Genesis 18. In fact, with Abraham, God appeared as an ordinary man and practically engaged him in friendly conversation. What are we to make of this? How are we to speak to a God, who at one moment shows Himself as a terrifying pillar of fire that will kill anyone who sets foot on Mount Sinai, and at another moment will allow a man to argue with Him and change his mind? Who will do what a man asks, instead of what He has said He would do? Apparently, when we have sincere faith and trust in God, we are allowed to ask Him to do things and even argue with Him. We always pray "thy will be done" as a sort of overarching principle of our desires, for we always must keep in mind the theological argument that God actually knows exactly what will happen and exceeds our capabilities by an infinite factor. Nevertheless, God will listen to His faithful and (apparently) allow them to intervene in His plans. This is a mystery that the human mind cannot fathom, and we cannot expect that God will always answer "yes". But if we read this passage without preconception, we have to conclude that God allows us to ask and even argue, if we pray in humility and faith.